I hope this is on-topic. I am reading about former Oxford University colleges. For many their historic location in the city is well documented. I just came across one however which is unclear. It is Canterbury College. Founded in 1311, as with other monastic colleges in Oxford (e.g. 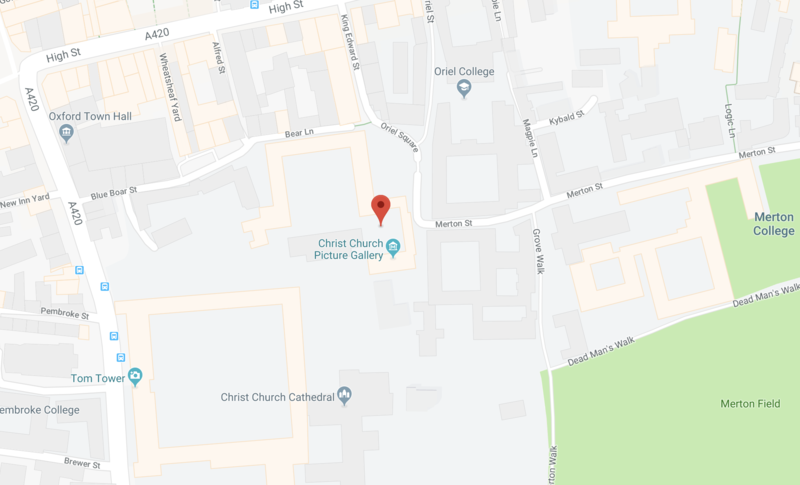 Gloucester College, Durham College and St. Mary's College), Henri VIII dissolved them, it's land being transferred to the Crown or sold to individuals or other non-monastic colleges. near the church of St. Peter-in-the-East. The site on which the college would be built was acquired from several sources, including the City of Oxford, Merton College and Queen's College. No particular mention to Canterbury College, which already existed when Queen's Colelge and New College were founded. On the north west side of the church there is just greens and the old wall, already existing when New College was set-up (and that they had since then maintained). Passing in front of the library, you will enter the last area on your visit to Christ Church, Canterbury Quadrangle. 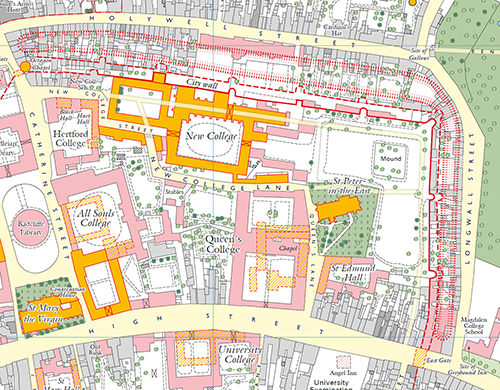 Built on the site of the medieval Canterbury College, after which the quad takes its name, ... Shortly after the dissolution of the monasteries by Henry VIII in the 1530s, the hall, chapel and other buildings of Canterbury College were acquired for the new Oxford foundation. Thus, this college claims that the site was in a rather different location of the old city (south). Since it had a hall, a chapel, and other buildings, it must have been sufficiently big to not fit "near the church of St. Peter-in-the-East". I've tried to search for confirmation of the above claim, particularly looking for an old map of Oxford, but I have not found one. Most of maps seems to be seventeen century onwards (e.g. a famous one here; zoom allowed). Maybe someone has better access to sources or know where to find sources to settle this issue? Note that South appears to be at the top of Agas's map. The Priory first sent 4 monks to study in Oxford in 1311, in a hall it had bought there near the church of St. Peter-in-the-East, but the actual college was founded in 1362 by Simon Islip, archbishop of Canterbury, in the parish of St. Edward. It is possible to see there that number 7 is the parish of St. Edward, referred in the article. 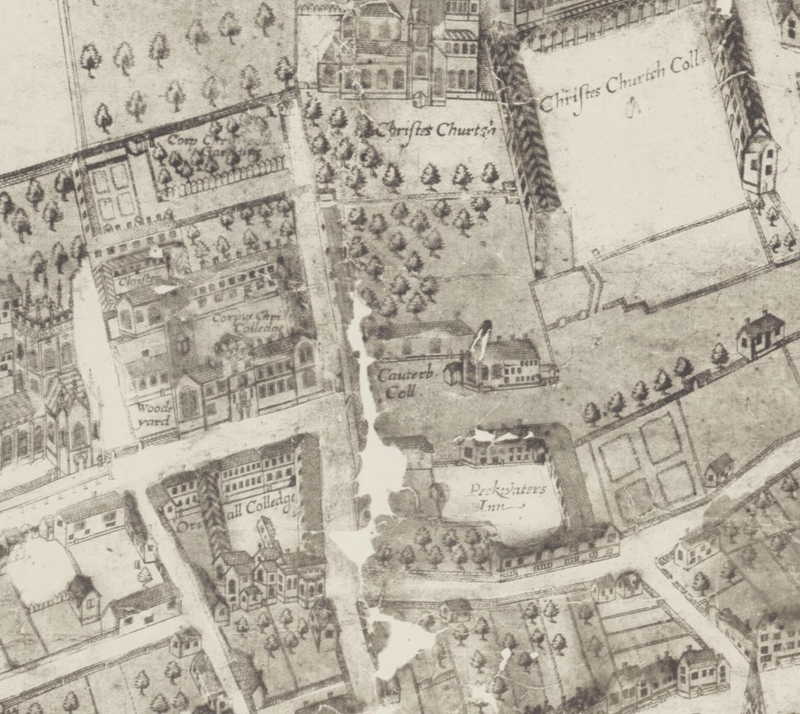 The college can also be seen where now is Christ Church college.